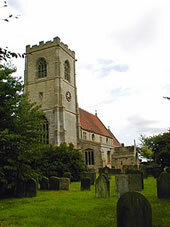 Throughout the length and breadth of England, in every village and hamlet, churches, often hundreds of years old, bear testimony to the spirituality and devotion of the people. Sadly, the decline of faith in the population in England has seen the closure of many of these beautiful buildings. Churches, many of which, withstood the trauma of the Reformation, have now become redundant. Their fate is unsure, some have been converted to private homes, factories or even demolished. These pages attempt to record the history and beauty of each church before it is too late. Whilst it would be wrong to attempt to deny the spirituality which these buildings represent, this site is devoted to the history and beauty of these buildings, not the faiths which they have nurtured through the years. Derelict and abandoned, Benington Church in South Lincolnshire. At best to become an Art Centre at worst who knows?